Indicate by check mark whether the registrant is a large accelerated filed, an accelerated filer, or non-accelerated filer or a smaller reporting company. See the definitions of “large accelerated filer,” “accelerated filer,” and “smaller reporting company” in Rule 12b-2 of the Exchange Act. As of September 30, 2008 the aggregate market value of the common voting stock held by non-affiliates of the issuer based upon the closing stock price of $4.15 per share was approximately $152,710,000. As of May 28, 2009, the registrant had 47,378,420 shares of common stock, par value $0.001, issued and outstanding. Portions of the Registrant’s proxy statement for its 2009 Annual Meeting of Shareholders filed with the Securities and Exchange Commission pursuant to Regulation 14A on July 1, 2009, as revised on July 30, 2009 are incorporated by reference into Part III of this report. BMB Munai, Inc. (the “Company”) is filing this Amendment No. 1 on Form 10-K/A (the “First Amendment”) to amend its Annual Report on Form 10-K for the fiscal year ended March 31, 2009, which was filed with the Securities and Exchange Commission (“SEC”) on June 15, 2009 (the “Original Annual Report”). This First Amendment is being filed in response to certain comments raised by the staff of the SEC in connection with prior year reports. During the fourth quarter of the fiscal year ended March 31, 2008, the Company discovered certain errors in its accounting for deferred income taxes during the fiscal years ended March 31, 2006, 2007 and during the interim periods of fiscal 2008. Believing these adjustments to be changes in accounting estimates rather than accounting errors, the Company reported the accounting adjustments in its annual report on Form 10-K for the year ended March 31, 2008, as fourth quarter adjustments. During that fourth quarter, the Company also implemented new policies to enhance its controls to require its reporting manager to become more familiar with Kazakhstan taxation issues and to require the reporting manager to specifically give consideration to taxation issues in connection with the preparation of the Company’s annual and interim financial statements. Subsequent to filing the Form 10-K for the year ended March 31, 2008, the Company determined the adjustments reported for the accounting for deferred income taxes was a correction of an error rather than a change in estimate, as disclosed in the Current Report on Form 8-K filed on July 8, 2009 and subsequent amendments thereto. The changes presented in this First Amendment, as detailed below, are made to present corrected prior period financial information and disclosure of accounting for deferred income taxes for the year ended March 31, 2008, as well as the interim periods for that fiscal year. As noted above, the Company had enhanced its controls and procedures for the accounting for deferred income taxes as of March 31, 2008. Therefore, all adjustments presented in this amendment relate to periods prior to March 31, 2008. Periods subsequent to March 31, 2008 are not effected as controls and procedures for deferred income taxes were operating effectively. Item 6 Selected Financial Data of the Original Annual Report is hereby amended to provide corrected Net income/(loss), Basic income/(loss) per common share figures for the fiscal years ended March 31, 2008, 2007 and 2006 and corrected Diluted income/(loss) per common share, Oil and gas properties, full cost method, net, Total assets, Total long term liabilities and Total Shareholders’ equity figures for the years ended March 31, 2007 and 2006. Item 7 Management’s Discussion and Analysis of Financial Condition and Results of Operations is also hereby amended to correct the net income and basic and diluted income per share disclosure for the years ended March 31, 2008 and 2007. Item 8 “Financial Statements and Supplementary Data” is hereby amended to reflect the changes discussed in the preceding paragraphs and to provide the correct Income Tax Benefit figures at March 31, 2008 and 2007 and corrected Stockholders’ Equity figures at March 31, 2007 and 2006. Note 2 has been revised to add a Restatement of Financial Statements section. Note 13 Income Taxes is hereby amended to provide corrected disclosure regarding our income tax accounting. Note 20 - Earnings Per Share Information has been amended to reflect the changes discussed above. Note 24 - Quarterly Financial Data (unaudited) is hereby amended to provide corrected Net income and Basic net income per share figures for the fiscal year ended March 31, 2008 and to provide corrected Net(loss)/ income, Basic net (loss)/income per share and Diluted net (loss)/income per share figures for the fiscal year ended March 31, 2007. In accordance with Rule 12b-15 under the Securities Exchange Act of 1934, this First Amendment also includes currently dated certifications from the Company’s Chief Executive Officer and Chief Financial Officer as required by Sections 302 and 906 of the Sarbanes-Oxley Act of 2002. The certification exhibits and signatures have been revised accordingly. A new consent of Hansen, Barnett & Maxwell, P.C. has also been included to the incorporation by reference of this First Amendment into the Registration Statement of the Company on Form S-3, as amended, currently on file with the Securities and Exchange Commission. This First Amendment speaks only to the original filing date of the Original Annual Report, and except for those Items discussed in this explanatory note, is unchanged from the Original Annual Report. This First Amendment does not reflect events after the filing of the Original Annual Report or modify or update those disclosures affected by subsequent events. Therefore, you should read this First Amendment together with the other reports of the Company that update and supersede the information contained in this First Amendment. This annual report on Form 10-K contains forward-looking statements within the meaning of Section 27A of the Securities Act of 1933, as amended, and Section 21E of the Securities Exchange Act of 1934, as amended that are based on management’s beliefs and assumptions and on information currently available to our management. For this purpose any statement contained in this annual report that is not a statement of historical fact may be deemed to be forward-looking, including, but not limited to, statements about our results of operations, cash flows, capital resources and liquidity, drilling plans and future exploration, production and well operations, reserves, licensing, commodity price environment, actions, intentions, plans, strategies and objectives. Without limiting the foregoing, words such as “expect,” “project,” “estimate,” “believe,” “anticipate,” “intend,” “budget,” “plan,” “forecast,” “predict,” “may,” “should,” “could,” “will” or comparable terminology are intended to identify forward-looking statements. These statements by their nature involve substantial risks and uncertainties and actual results may differ materially depending on a variety of factors, many of which are not within our control. These factors include, but are not limited to, market factors, market prices (including regional basis differentials) of natural gas and oil, results for future drilling and marketing activity, future production and costs, economic conditions, competition, legislative requirements and changes and the effect of such on our business, sufficiency of future working capital, borrowings, capital resources and liquidity and other factors detailed herein and in our other Securities and Exchange Commission filings. Should one or more of these risks or uncertainties materialize, or should underlying assumptions prove incorrect, actual outcomes may vary materially from those indicated. Forward-looking statements are predictions and not guarantees of future performance or events. The forward-looking statements are based on current industry, financial and economic information, which we have assessed but which by their nature are dynamic and subject to rapid and possibly abrupt changes. Our actual results could differ materially from those stated or implied by such forward-looking statements due to risks and uncertainties associated with our business. We hereby qualify all our forward-looking statements by these cautionary statements. Throughout this annual report, unless otherwise indicated by the context, references herein to the “Company”, “BMB”, “we”, our” or “us” means BMB Munai, Inc, a Nevada corporation, and its corporate subsidiaries and predecessors. Throughout this annual report all references to dollar amounts ($) refers to U.S. dollars unless otherwise indicated. The following discussion should be read in conjunction with our financial statements and the related notes contained elsewhere in this report and in out our other filings with the Securities and Exchange Commission. BMB Munai, Inc., our company, is organized under the laws of the State of Nevada. Our business activities focus on oil and natural gas company exploration and production in the Republic of Kazakhstan (sometimes also referred to herein as the “ROK” or “Kazakhstan”). We hold an exploration contract that allows us to conduct exploration drilling and oil production in the Mangistau Province in the southwestern region of Kazakhstan. Since the date of execution of the original exploration contract, we have successfully negotiated several amendments to the contract that have extended the term of the contract to January 2013 and extended the territory of the contract area to approximately 850 square kilometers. Our business is subject to many factors beyond our control. Foremost is the fluctuation of oil and gas prices. Historically, oil and gas markets have been cyclical and volatile. During fiscal year 2009 we experienced wide fluctuation in the world price for oil. We expect prices to continue to be difficult to predict. While our revenues are a function of both production and prices, wide swings in commodity prices will likely continue to have a significant impact on our results of operations. We have not elected to engage in hedging transactions because we do not have the necessary infrastructure or the required flexibility in our rights to conduct export transactions. Our operations entail significant complexities due to the depth and geological makeup of the structures we are entering. Advanced technologies requiring highly trained personnel are utilized in both exploration and development. Even when the technology is properly used, we still may not know conclusively whether hydrocarbons will be present nor the rate at which they may be produced when wells are completed. Despite our best efforts to limit our risks, exploration drilling is a high-risk activity that may not yield commercial production or reserves. Our business, as with other extractive industries, depletes our reserves and therefore oil and gas produced must be replaced for our Company to remain viable. During the past fiscal year we have realized a net increase in our reserves over the end of fiscal year 2008. Since 2004 we have been actively drilling wells in each field on the ADE Block and since 2005 we have been drilling in the Southwest Block in the Kariman field. Our activities have been funded through private placements of equity and debt securities as well as income generated from sales of our exploration stage oil production. Our drilling activities have consisted in drilling an array of exploratory wells to delineate reservoir structures and developmental wells intended to provide income to the Company. Our operational focus during the last fiscal year has been to continue our practice of increasing our oil reserves by developing resource category assets to reserve category assets and proved undeveloped reserves to proved developed reserves. Currently, we have 1,230 gross (1,230 net) proved developed producing acres, plus 180 gross (180 net) acres of proved undeveloped reserves. We also hold approximately 112,260 gross (112,260 net) unproved, undeveloped acres. During the last fiscal year we completed a very active three-year drilling program on our territory. During this time we drilled 17 wells to an average depth of 3,800 meters. Beginning in September of 2008 we began to phase out our new well drilling activities and we have released four large drilling rigs since that date as current drilling projects were completed. Reduce our current accounts payable. As a result of the collapse of world oil prices in 2008, depressed local oil prices, contractual commitments to drillers and the tax structure imposed on oil exporters by the ROK, we saw significant increase in our current accounts payable over our current assets. Responding to this financial stress has required us to seek special arrangements with creditors and to temporarily cease drilling new wells. We made significant progress in reducing our current accounts payable during the later part of the fiscal year. Conduct field operations focused on maximizing production and field delineation. We will focus on increasing our oil production without substantial capital outlay during the next fiscal year. We are concentrating efforts on stabilizing production from our existing wells by using a smaller workover rig and by installing pumps on various wells to establish consistent production in each of our oil fields. Our existing wells are sufficient in number to allow us to integrate our geological and geophysical reports, seismic data, drilling logs, testing and production logs to create a complete profile of the ADE Block and Kariman field. Similar to most oil production in Kazakhstan, our oil is produced mainly from carbonate rocks of limestone and dolomite. These formations can prove to be challenging when attempting to understand oil field structure, designate well locations and determination of the number of wells required to develop a field. A full understanding of these issues is critical, as they can have a substantial impact on a field’s commercial viability and the expect return on investment. We have engaged experts in the United States with experience working in Kazakhstan with these issues to assist our internal engineering staff. Commence investigation of the Northwest Block. Our contract territory nearly doubled during the last fiscal year due to our successful negotiation of an amendment to our exploration contract to acquire rights to the Northwest Block. The Northwest Block did have limited Soviet-period exploration and drilling conducted on it. It is our intention to review the historical geological records of the area and to conduct new 3D seismic studies of this Block during the coming fiscal year. We anticipate that the seismic work will be complete during the current fiscal year and that interpretation of the data will be available in the second calendar quarter of 2010. The following table sets forth our estimated net proved oil and natural gas reserves and the standardized measure of discounted future net cash flows related to such reserves as of March 31, 2009. We engaged Chapman Petroleum Engineering, Ltd. (“Chapman”), to estimate our net proved reserves, projected future production and the standardized measure of discounted future net cash flows as of March 31, 2009. Chapman’s estimates are based upon a review of production histories and other geologic, economic, ownership and engineering data provided by us. Chapman has independently evaluated our reserves for the past several years. In estimating the reserve quantities that are economically recoverable, Chapman used oil and natural gas prices in effect as of March 31, 2009 without giving effect to hedging activities. In accordance with requirements of the Securities and Exchange Commission (the “SEC”) regulations, no price or cost escalation or reduction was considered by Chapman. The standardized measure of discounted future net cash flows is not intended to represent the current market value of our estimated oil and natural gas reserves. The oil and natural gas reserve data included in, or incorporated by reference in this document, are only estimates and may prove to be inaccurate. Under our exploration contract we have the right to sell the oil and natural gas we produce while we undertake exploration stage activities within our licensed territory. As discussed in more detail in “Risk Factors” and “Properties” we have the right to engage in exploration stage activities until January 9, 2013. To retain our rights to produce and sell oil and natural gas after that date, we must apply for and be granted commercial production rights by no later than January 2013 or obtain a further extension of our exploration contract. If we are not granted commercial production rights or another extension by that time, we would expect to lose our rights to the licensed territory and would expect to be unable to produce reserves after January 2013. Proved developed reserves are proved reserves that are expected to be recovered from existing wells with existing equipment and operating methods. Proved undeveloped reserves are proved reserves which are expected to be recovered from new wells on undrilled acreage or from existing wells where a relatively major expenditure is required for recompletion. The standardized measure of discounted future net cash flows represents the present value of future net cash flow net of all taxes. The reserve data set forth herein represents estimates only. Reserve engineering is a subjective process of estimating underground accumulations of oil and natural gas that cannot be measured in an exact manner. The accuracy of any reserve estimate is a function of the quality of available data and of engineering and geological interpretation and judgment. As a result, estimates made by different engineers often vary. In addition, results of drilling, testing and production subsequent to the date of an estimate may justify revision of such estimates, and such revisions may be material. Accordingly, reserve estimates are generally different from the quantities of oil and natural gas that are ultimately recovered. Furthermore, the estimated future net revenue from proved reserves and the present value thereof are based upon certain assumptions, including current prices, production levels and costs that may vary from what is actually incurred or realized. No estimates of proved reserves comparable to those included herein have been included in reports to any federal agency other than the SEC. In accordance with SEC regulations, the Chapman Report used oil and natural gas prices in effect at March 31, 2009. The prices used in calculating the standardized measure of discounted future net cash flows attributable to proved reserves do not necessarily reflect market prices for oil and natural gas production subsequent to March 31, 2009. There can be no assurance that all of the proved reserves will be produced and sold within the periods indicated, that the assumed prices will actually be realized for such production or that existing contracts will be honored or judicially enforced. There are a variety of factors which affect the market for oil and natural gas, including the extent of domestic production and imports of oil and natural gas, the availability, proximity and capacity of natural gas pipelines and other transportation facilities, demand for oil and natural gas, the marketing of competitive fuels and the effects of state and federal regulations on oil and natural gas productions and sales. In the exploration, development and production business, production is normally sold to relatively few customers. We are now exporting nearly all of our test production for sale in the world market. Currently, 81% of our production is being sold to one client, Titan Oil (former Euro-Asian Oil AG). Revenue from oil sold to Titan Oil made up 94% of our total revenue. The loss of Titan Oil may have a material adverse effect on our operations in the short-term. Based on current demand for crude oil and the fact that alternate purchasers are readily available, we believe the loss of Titan Oil would not materially adversely effect our operations long-term. Our crude oil exports are transported via the Aktau sea port to world markets. Pursuant to our agreement with Titan Oil (formerly Euro-Asian Oil AG), delivery is FCA (Incoterms 2000) at the railway station in Mangishlak. The oil is shipped via railway cars provided by Titan Oil (formerly Euro-Asian Oil AG). The volume and sales price are determined on a monthly basis, with all payments being covered by an irrevocable standby letter of credit opened through a first-class international bank. Sales prices is based on the average quoted Brent crude oil price from Platt's Crude Oil Marketwire for the three days following the bill of lading date less a discount for transportation expenses, freight charges and other expenses. The quality of crude oil supplied must meet minimum quality specifications. Competition in Kazakhstan and Central Asia includes other junior hydrocarbons exploration companies, mid-size producers and major exploration and production companies. We compete for additional exploration and production properties with these companies who in many cases have greater financial resources and larger technical staffs than we do. We face significant competition for capital from other exploration and production companies and industry sectors. At times, other industry sectors may be more in favor with investors, limiting our ability to obtain necessary capital. However, we expect that our success and market exposure during the past several years has positioned us to seek financing to meet our business objectives. We believe we have a competitive advantage in Kazakhstan in that our management team is comprised of Kazakh nationals who have developed trusted relationships with many of the departments and ministries within the government of Kazakhstan. Our operations are subject to various levels of government controls and regulations in both the United States and Kazakhstan. We focus on compliance with all legal requirements in the conduct of our operations and employ business practices that we consider to be prudent under the circumstances in which we operate. It is not possible for us to separately calculate the costs of compliance with environmental and other governmental regulations as such costs are an integral part of our operations. In Kazakhstan, legislation affecting the oil and gas industry is under constant review for amendment or expansion. Pursuant to such legislation, various governmental departments and agencies have issued extensive rules and regulations which affect the oil and gas industry, some of which carry substantial penalties for failure to comply. These laws and regulations can have a significant impact that can adversely affect our profitability by increasing the cost of doing business and by imposition of new taxes, tax rates and tax schemes. Inasmuch as new legislation affecting the industry is commonplace and existing laws and regulations are frequently amended or reinterpreted, we are unable to predict the future cost or impact of complying with such laws and regulations. We have approximately 360 full-time employees. None of our employees are covered by collective bargaining agreements. From time to time we utilize the services of independent consultants and contractors to perform various professional services. Field and on-site production operation services, such as pumping, maintenance, dispatching, inspection and testing are generally provided by independent contractors. Our principal executive and corporate offices are located in an office building located at 202 Dostyk Avenue, in Almaty, Kazakhstan. We lease this space and believe it is sufficient to meet our needs for the foreseeable future. We also maintain an administrative office in Salt Lake City, Utah. The address is 324 South 400 West, Suite 225, Salt Lake City, Utah 84101, USA. We file annual reports on Form 10-K, quarterly reports on Form 10-Q, current reports on Form 8-K and other items with the Securities and Exchange Commission (“SEC”). We provide free access to all of these SEC filings, as soon as reasonably practicable after filing, on our Internet web site located at www.bmbmunai.com. In addition, the public may read and copy any documents we file with the SEC at the SEC's Public Reference Room at 100 F Street N.E., Washington, DC 20549. The public may obtain information on the operation of the Public Reference Room by calling the SEC at 1-800-SEC-0330. The SEC maintains its Internet site www.sec.gov, which contains reports, proxy and information statements and other information regarding issuers like BMB Munai. Our current liabilities exceed our current assets which, if not resolved, may result in the Company being unable to satisfy its obligations or make suitable arrangements with creditors as obligations become due. At March 31, 2009, our current liabilities exceeded our current assets by $11,218,705. This has created liquidity problems for the Company. This increase in current liabilities over current assets arose from the steep decline in world oil prices, a drop in oil production and the export duty imposed by the government at a time when we were under contractual obligation to drill wells at four locations on our contract territory. In an effort to correct this situation we have ceased drilling new wells and we are working with creditors to establish payment schedules or otherwise reduce our current liabilities while continuing operations. We have no assurance that we will be successful in negotiating favorable terms with our creditors. If we are unable to pay our debts or make suitable arrangement with creditors, this might be asserted to be an event of default under the Indenture governing our 5.0% convertible senior notes due 2012 (the “Notes”) and an event of default could result in the Notes becoming immediately due. We currently have insufficient funds to repay the Note principal. Given the current conditions in the credit and financial markets, we believe it would be difficult to obtain funding to retire the Notes if demand for payment were to be made prior to the scheduled maturity date. The current financial crisis and economic conditions have and may continue to have a material adverse impact on our business and financial condition that we cannot predict. The economic conditions in the United States and throughout the world have deteriorated during the past fiscal year. The global financial markets have experienced a period of unprecedented turmoil and upheaval characterized by extreme volatility and declines in prices of securities, diminished liquidity and credit availability, inability to access capital, the bankruptcy, failure, collapse or sale of financial institutions and an unprecedented level of intervention from the U.S. federal government and other governments. In particular, the cost of raising money in the debt and equity capital markets has increased substantially while the availability of funds from those markets generally has diminished significantly. Also, as a result of concerns about the stability of financial markets generally and the solvency of counterparties specifically, the cost of obtaining money from the credit markets generally has increased as many lenders and institutional investors have increased interest rates, enacted tighter lending standards, refused to refinance existing debt at maturity and, have reduced and in many cases, ceased to provide any new funding. the demand for oil and natural gas may decline due to weak international economic conditions. Oil and gas prices are characteristically volatile, and if they remain low for a prolonged period, our revenues, profitability and cash flows will decline. A sustained period of low oil and natural gas prices would adversely affect our business operations, our asset values and our financial condition and ability to meet our financial commitments. limit our ability to borrow money or raise additional capital. We may not have the funds, or the ability to raise the funds, necessary to repurchase the Notes when they become due. The Notes mature in July 2012. However, the indenture agreement governing the Notes provides that following a change in control of the Company, or on July 13, 2010, holders of the Notes may require us to repurchase their Notes. We do not currently have funds to do so, nor do we expect to generate sufficient funds from operations by July 2010 to pay the repurchase price of any Notes if tendered. Our failure to repurchase the Notes when required would result in an event of default with respect to the notes. Such an event of default could negatively affect the trading price of our common stock because the event of default could lead to the principal and accrued but unpaid interest on the outstanding notes becoming immediately due and payable. Lower oil and natural gas prices may not only decrease our revenues, profitability and cash flows, but also reduce the amount of oil and gas that we can produce economically. This may result in downward adjustments to our estimated proved reserves. Substantial decreases in oil and gas prices could render our future planned exploration and development projects uneconomical. If this occurs, or if our estimates of development costs increase, production data factors change or drilling results deteriorate, accounting rules may require us to write down, as a non-cash charge to earnings, the carrying value of our properties for impairments. We are required to perform impairment tests on our assets periodically and whenever events or changes in circumstances warrant a review of our assets. To the extent such tests indicate a reduction of the estimated useful life or estimated future cash flows of our assets, the carrying value may not be recoverable and may, therefore, require a write-down of such carrying value. We may incur impairment charges in the future, which could have a material adverse effect on our results of operations in the period incurred and on our ability to borrow funds under our credit agreements. Unless we replace our oil and natural gas reserves, our reserves and future production will decline, which would adversely affect our cash flows and income. Unless we conduct successful development, exploration and exploitation activities, our proved reserves will decline as those reserves are produced. Producing oil and natural gas reservoirs generally are characterized by declining production rates that vary depending upon reservoir characteristics and other factors. Our future oil and natural gas reserves and production, and, therefore our cash flow and income, are highly dependent upon our success in efficiently developing and exploiting our current reserves and economically finding or acquiring additional recoverable reserves. If we are unable to develop, exploit, find or acquire additional reserves to replace our current and future production, our cash flow and income will decline as production declines, until our existing properties would be incapable of sustaining commercial production. We may not be able to replace our reserves or generate cash flows if we are unable to raise capital. government regulations relating to safety and the environment. Historically, we have financed these expenditures primarily with cash raised through the sale of our equity and debt securities and revenue generated by operations. If our revenues or borrowing base decreases, which is expected, as a result of lower oil and natural gas prices, operating difficulties or declines in reserves, we may have limited ability to expend the capital necessary to undertake or complete future drilling programs. Additional debt or equity financing or cash generated by operations may not be available to meet these requirements. Due to the current low prices for oil and gas and the restrictions in the capital markets due to the global financial crisis, we anticipate that we will not have any significant capital available during the upcoming fiscal year to make substantial capital expenditures. Drilling for and producing oil and gas is a costly and high-risk activity with many uncertainties that could adversely affect our financial condition or results of operations. uncontrollable flows of oil, gas or well fluids. A productive well may become uneconomical in the event deleterious substances are encountered, which impair or prevent the production of oil or gas from the well. In addition, production from any well may be unmarketable if it is contaminated with water or other deleterious substances. We may drill wells that are unproductive or, although productive, do not produce oil or gas in economic quantities. Unsuccessful drilling activities could result in higher costs without any corresponding revenues. Furthermore, the successful completion of a well does not ensure a profitable return on the investment. Reserve estimates depend on many assumptions that may turn out to be inaccurate. Any material inaccuracies in these reserve estimates or underlying assumptions will materially affect the size and present value of our reserves. The process of estimating oil and natural gas reserves is complex. It requires interpretations of available technical data and many assumptions, including assumptions relating to economic factors. Any significant inaccuracies in these interpretations or assumptions could materially affect the estimated quantities and present value of reserves shown in this report. In order to prepare estimates, we must project production rates and timing of development expenditures. We must also analyze available geological, geophysical, production and engineering data. The extent, quality and reliability of this data can vary. The process also requires economic assumptions about matters such as oil and natural gas prices, drilling and operating expenses, capital expenditures, taxes and availability of funds. Therefore, estimates of oil and natural gas reserves are inherently imprecise. Actual future production, oil and natural gas prices, revenues, taxes, development expenditures, operating expenses and quantities of recoverable oil and natural gas reserves most likely will vary from our estimates. Any significant variance could materially affect the estimated quantities and present value of reserves shown in this report. In addition, we may adjust estimates of proved reserves to reflect production history, results of exploration and development, prevailing oil and natural gas prices and other factors, many of which are beyond our control. You should not assume that the present value of future net revenues from our proved reserves referred to in this report is the current market value of our estimated oil and natural gas reserves. In accordance with SEC requirements, we generally base the estimated discounted future net cash flows from our proved reserves on prices and costs on the date of the estimate. Actual future prices and costs may differ materially from those used in the present value estimate. If future values decline or costs increase, it could have a negative impact on our ability to finance operations; individual properties could cease being commercially viable; affecting our decision to continue operations on producing properties or to attempt to develop properties. All of these factors would have a negative impact on earnings and net income, and most likely the trading price of our securities. We will be unable to produce up to 68% of our proved reserves if we are not able to obtain a commercial production contract or extend our current exploration contract, which would likely require us to terminate our operations. Under our exploration contract on our properties we have the right to produce oil and gas only until January 2013, yet 68% of our proved reserves are scheduled to be produced after January 2013. We have the exclusive right to negotiate a commercial production contract as per the terms of our exploration contract. The MEMR does not make public its determinations on the granting of commercial production rights. Based on discussions with the MEMR, we have learned that the primary factors used by the MEMR in determining whether to grant commercial production rights are whether the contract holder has fulfilled its minimum work program commitments, proof of commercial discovery and submission of an approved development plan by a third-party petroleum institute in Kazakhstan to exploit the established commercial reserves. Typically, if commercial production rights are not granted it is because the contract holder has failed to make a commercial discovery within their contract territory and had decided to abandon the contract territory or the contract holder has insufficient funds to complete its minimum work program requirement and was unable to complete the necessary work to substantiate the presence of commercially producible reserves to the MEMR. Our efforts are focused toward meeting our minimum work program requirements and making and substantiating commercial discoveries in as many of the identified structures as possible to support our application for commercial production rights. If we are not granted commercial production rights prior to the expiration of our exploration contract, we may lose our right to produce the reserves on our current properties. If we are unable to produce those reserves, we will be unable to realize revenues and earnings and to fund operations and we would most likely be unable to continue as a going concern. Prospects that we decide to drill may not yield oil or natural gas in commercially viable quantities or quantities sufficient to meet our targeted rate of return. The structures we have located on our territory are typically at a depth of 3,100 to 3,800 meters and some structures may be deeper in the Northwest Block. The rock is generally carbonates of limestone and dolomite, which can inhibit oil flow and well drainage and thereby results in higher risk drilling, reduced well drainage areas, lower production rates and higher than expected well decline rates. These factors in turn adversely effect the valuation of our reserve base. We attempt to address these challenges through careful selection of drilling sites and we are now in process of developing models of our oil fields that will guide our well locations, drilling activities and technology deployment. economically viable. Even with seismic data and other technologies and the study of producing fields in the same area, we cannot know conclusively prior to drilling whether oil or natural gas will be present or, if present, will be present in commercial quantities. The analysis that we perform using data from other wells, more fully explored prospects and/or producing fields may not be useful in predicting the characteristics and potential reserves associated with our drilling prospects. When we drill unsuccessful wells, our drilling success rate declines and we may not achieve our targeted rate of return. We may incur substantial losses and be subject to substantial liability claims as a result of our operations. Any of these risks could adversely affect our ability to conduct operations or result in substantial losses. In instances when we believe that the cost of available insurance is excessive relative to the risks presented we may elect not to obtain insurance. In addition, pollution and environmental risks generally are not fully insurable. If a significant accident or other event occurs that is not fully covered by insurance, it could adversely affect us. Under these laws, we could be liable for personal injuries, property damage and other damages. Failure to comply with these laws may also result in the suspension or termination of our licenses or operations and could subject us to administrative, civil and criminal penalties. Moreover, these laws could change in ways that substantially increase our costs. Any such liabilities, penalties, suspensions, terminations or regulatory changes could materially adversely affect our financial condition and results of operations. We believe that there is political and legal risk doing business in Kazakhstan, as the country has existed for less than two decades and is still in process of developing stable and predictable laws required to underpin a free market economy and foster private enterprise. We may incur substantial liabilities to comply with environmental laws and regulations. Our oil and natural gas operations are subject to governmental laws and regulations relating to the release or disposal of materials into the environment or otherwise relating to environmental protection. These laws and regulations may require the acquisition of permits before drilling commences, restrict the types, quantities and concentration of substances that can be released into the environment in connection with drilling and production activities and impose substantial liabilities for pollution resulting from our operations. Failure to comply with these laws and regulations may result in the assessment of administrative, civil and criminal penalties, imposition of investigatory or remedial obligations or even injunctive relief. Changes in environmental laws and regulations occur frequently. Any changes that result in more stringent or costly waste handling, storage, transport, disposal or cleanup requirements could require us to make significant expenditures to maintain compliance, and may otherwise have a material adverse effect on our results of operations, competitive position or financial condition as well as on the industry in general. Under these environmental laws and regulations, we could be held strictly liable for the removal or remediation of previously released materials or property contamination regardless of whether we were responsible for the release or whether our operations were standard in the industry at the time they were performed. Because of our lack of asset and geographic diversification, adverse developments in our operating area would adversely affect our results of operations. Substantially all of our assets are currently located in southwestern Kazakhstan. As a result, our business is disproportionately exposed to adverse developments affecting this region. These potential adverse developments could result from, among other things, changes in governmental regulation, capacity constraints with respect to storage facilities, transportation systems and pipelines, curtailment of production, natural disasters or adverse weather conditions in or affecting these regions. Due to our lack of diversification in asset type and location, an adverse development in our business or the area in which we operate would have a significantly greater impact on our financial condition and results of operations than if we maintained more diverse assets and operating areas. The unavailability or high price of transportation systems could adversely affect our ability to deliver our oil on terms that would allow us to operate profitably, or at all. Because of the location of our properties, the crude oil we produce must be transported by truck or by rail. In the future it will likely also be transported by pipelines. These railways and pipelines are operated by state-owned entities or other third-parties, and there can be no assurance that these transportation systems will always be functioning and available, or that the transportation costs will not become cost prohibitive. In addition, any increase in the cost of transportation or reduction in its availability to us could have a material adverse effect on our results of operations. There is no assurance that we will be able to procure sufficient transportation capacity on economical terms, if at all. We depend on one customer for sales of crude oil. A reduction by this customer in the volumes of oil it purchases could result in a substantial decline in our revenues and net income. During the year ended March 31, 2009, we sold approximately 81% of our crude oil production to Titan Oil (formerly Euro-Asian Oil AG). Revenue from oil sold to Titan Oil made up 94% of our revenue during the year ended March 31, 2009. The loss of Titan Oil may have a material adverse effect on our operations in the short-term. Based on current demand for crude oil and the fact that alternate purchasers are readily available, we believe the loss of Titan Oil would not materially adversely effect our operations long-term. If you purchase shares of our stock, your investment will be subject to the same risks inherent in international operations, including, but not limited to, adverse governmental actions, political risks, and expropriation of assets, loss of revenues and the risk of civil unrest or war. While we have significant experience working in Kazakhstan, and feel we have good relationships with government agencies at many levels, we remain subject to all the risks inherent in international operations, including adverse governmental actions, uncertain legal and political systems, and expropriation of assets, loss of revenues and the risk of civil unrest or war. Our primary oil and gas properties are located in Kazakhstan, which until 1990 was part of the Soviet Union. Kazakhstan retains many of the laws and customs of the former Soviet Union, but has and is continuing to develop its own legal, regulatory and financial systems. As the political and regulatory environment changes, we may face uncertainty about the interpretation of our agreements; in the event of dispute, we may have limited recourse within the legal and political system. government is required to conduct these negotiations under the “Law of Petroleum.” The terms of the commercial production contract will establish the royalty and other payments due to the government in connection with commercial production. At the time the commercial production contract is issued, we will be required to begin repaying the government its historical investment costs of exploration and development of the ADE Block and the Extended Territory. Our obligation associated with the ADE Block is approximately $6 million. Our obligation associated with the Extended Territory is approximately $5.3 million. If satisfactory terms for commercial production rights cannot be negotiated, it could have a material adverse effect on our financial position. Our ability to obtain additional financing or use our operating cash flow to fund operations may be adversely affected by our level of indebtedness. Our debt may limit our flexibility to adjust to changing market conditions, changes in our industry and economic downturns. international economic, legal and regulatory factors unrelated to our performance. It is unlikely that we will be able to pay dividends on our common stock. We have never paid dividends on our common stock. We cannot predict with certainty that our operations will result in sufficient revenues to enable us to operate profitably and with sufficient positive cash flow so as to enable us to pay dividends to the holders of common stock. The percentage ownership evidenced by the common stock is subject to dilution. We are authorized to issue up to 500,000,000 shares of common stock and are not prohibited from issuing additional shares of such common stock. Moreover, to the extent that we issue any additional common stock, a holder of the common stock is not necessarily entitled to purchase any part of such issuance of stock. The holders of the common stock do not have statutory “preemptive rights” and therefore are not entitled to maintain a proportionate share of ownership by buying additional shares of any new issuance of common stock before others are given the opportunity to purchase the same. Accordingly, you must be willing to assume the risk that your percentage ownership, as a holder of the common stock, is subject to change as a result of the sale of any additional common stock, or other equity interests in the Company. Our common stock is an unsecured equity interest. Just like any equity interest, our common stock will not be secured by any of our assets. Therefore, in the event of our liquidation, the holders of our common stock will receive distributions only after all of our secured and unsecured creditors have been paid in full. There can be no assurance that we will have sufficient assets after paying its secured and unsecured creditors to make any distribution to the holders of our common stock. Provisions in Nevada law could delay or prevent a change in control, even if that change would be beneficial to our stockholders. Certain provisions of Nevada law may delay, discourage, prevent or render more difficult an attempt to obtain control of us, whether through a tender offer, business combination, proxy contest or otherwise. The provisions of Nevada law are designed to discourage coercive takeover practices and inadequate takeover bids. These provisions are also designed to encourage persons seeking to acquire control of us to first negotiate with our board of directors. Under the statutory scheme in the Republic of Kazakhstan prospective oil fields are developed in two stages. The first stage is an exploration and appraisal stage during which a private contractor is given a license to explore for oil and gas on a territory for a set term of years. During this stage the primary focus is on the search for a commercial discovery, i.e., a discovery of a sufficient quantity of oil and gas to make it commercially feasible to pursue execution of, or transition to, a commercial production contract with the government. Under the terms of an exploration contract the contract holder has the right to sell all oil and natural gas produced during the term of the exploration contract. We currently own a 100% interest in a license to use subsurface mineral resources and a hydrocarbon exploration contract issued by the ROK in 1999 and 2000, respectively (collectively referred to herein as the (“license” or the “exploration contract”). When initially granted, the exploration and development stage of our exploration contract had a five year term, with provision for two extensions for a period of two years each. On June 24, 2008 the MEMR agreed to extend the exploration stage of our exploration contract until January 2013. Initially, the exploration contract granted us the right to engage in exploration and development activities in an area of approximately 200 square kilometers referred to herein as the “ADE Block.” The ADE Block is comprised of three fields, the Aksaz, Dolinnoe and Emir fields. During our 2006 fiscal year our exploration contract was expanded to include an additional 260 square kilometers of land adjacent to the ADE Block, which we refer to herein as the “Southeast Block”, which includes the Kariman oil and gas field and the Borly and Yessen structures. In October 2008 the MEMR granted a further extension of the territory covered under our exploration contract to include an additional 390 square kilometer area, bring our total contract area to 850 square kilometers (approximately 210,114 acres). 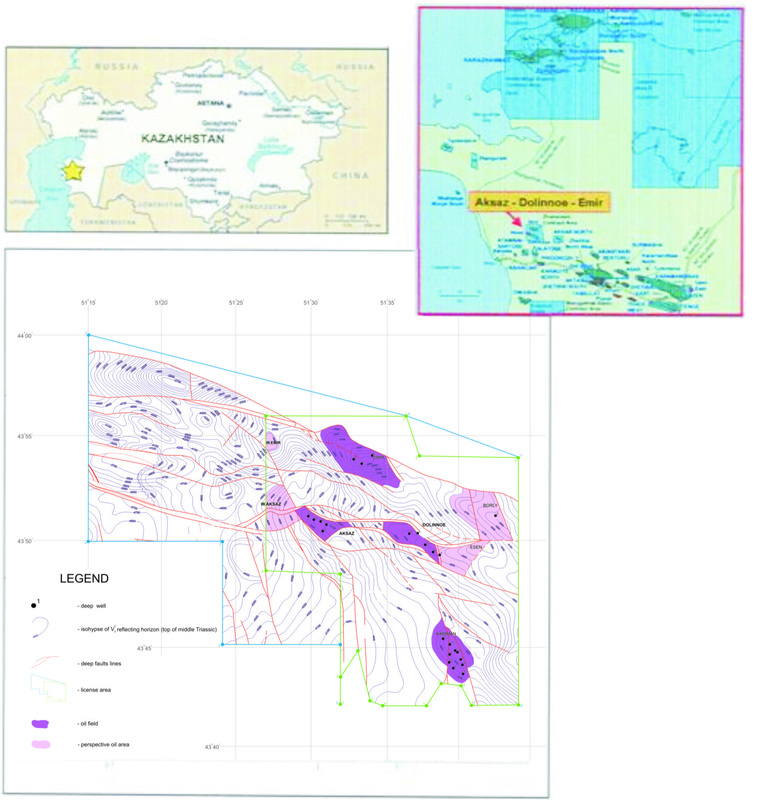 The additional territory is located to the north and west of our current exploration territory, extending the exploration territory toward the Caspian Sea and is referred to herein as the “Northwest Block.” The Southeast Block and the Northwest Block are governed by the terms of our exploration contract. In order to be assured that adequate exploration activities are undertaken during exploration stage, the MEMR establishes an annual mandatory minimum work program to be accomplished in each year of the exploration contract. Under the minimum work program the contractor is required to invest a minimum dollar amount in exploration activities within the contract territory, which may include geophysical studies, construction of field infrastructure or drilling activities. During the exploration stage, the contractor is also required to drill sufficient wells in each field to establish the existence of commercially producible reserves in any field for which it seeks a commercial production license. Failure to complete the minimum work program requirements for any particular field during the term of the exploration contract could preclude the contractor from receiving a longer-term production contract for such field, regardless the success of the contractor in proving commercial reserves during the partial fulfillment of the minimum work program. The contract we hold follows the above format. The contract sets the minimum dollar amount we must expend during each year of our work program. Through July 2009, our work program year ended on July 9 each year. As a result of certain changes to our exploration license, our work program year end has now changed to January 9 of each year through January 9, 2013. Therefore our work program year does not coincide with our fiscal year. As a result of these timing differences, the amounts reflected in the table below as “Actually Made” may differ from amounts disclosed elsewhere in our Management’s Discussion and Analysis or Consolidated Financial Statements, which present figures based on our fiscal year rather than our work program year. * Investment as of March 31, 2009. As reflected in the above table, in connection with the extension of the term and territory of our exploration contract, we agreed to expend not less than $72.7 million dollars in additional work program activities through January 9, 2013. Under the rules of the MEMR there is an option for expenditures above the minimum requirements in one period to be carried over to meet minimum obligations in future periods. As the above chart shows we have significantly exceeded the minimum expenditure requirement in each period of the contract and have more than doubled the total minimum capital expenditure requirement during the exploration stage. In addition to mandatory minimum capital expenditures in each year, exploration contracts typically require the contract holder to drill a certain number of wells in each structure for which it plans to seek commercial production rights. In Kazakhstan, typically, one exploratory well and two appraisal wells are sufficient to support a claim of commercially producible reserves in a particular field, although in some cases, commercial reserves have been demonstrated with fewer wells. The total number of wells the MEMR requires during exploration stage is generally determined by the number of fields or structures identified by the seismic studies done on a territory. 3D seismic studies completed on the ADE Block and the Southeast Block, have identified six potential fields or structures. We plan to perform 3D seismic studies on the Northwest Block to identify potential structures in that Block. (1) Addendum No. 6 to our exploratory contract requires the drilling of three exploratory wells. Depending upon the results of 3D seismic studies of the Northwest Block we may need to drill additional exploratory and appraisal wells in the Northwest Block. Pursuant to the terms of the extensions of our exploration contract, we will be required to drill not less than nine new wells by January 9, 2013. If we discover structures in the Northwest Block, we will need to drill additional wells to determine and establish the existence of commercially producible reserves within the various structures in our license territory. The bottom half of the above chart shows current progress on drilling of exploratory and appraisal wells. To date we have been conservative in our approach to exploration. It has been our practice to drill our first few wells serially. Our first well was the Dolinnoe-2 well drilled in 2004. This was followed by the Dolinnoe-3 well, and then the Aksaz-4 and Kariman-1 wells. While we have verified the presence of oil and gas in all our wells thus far, not all our wells produce oil at commercial levels. We have expended substantial time and money to study our wells. The purpose of the exploration stage is to study the geology and geophysical characteristics of each field and individual well, with a view to qualifying for a longer-term production contract. Once drilling of a well is completed, our emphasis focuses on an extended period of testing a well’s production characteristics and capacities to determine the best method for producing oil from that well and to gain insight into the further development of the entire field. During exploration, oil production is subject to wide fluctuations caused by varying pressures commonly experienced in new wells and by significant periods of well closure to accommodate mandatory testing. Maximizing oil production only becomes the central focus during the post-exploration phase when exploiting the commercial discovery commences under a production contract. Under our exploration contract, we have the exclusive right to apply for and negotiate a commercial production contract. The government is required to negotiate the terms of these rights in good faith in accordance with the Law of Petroleum of Kazakhstan. Based on discussions with the MEMR, the primary factors used by the MEMR in determining whether to grant commercial production rights are whether the contract holder has fulfilled the minimum work program commitments, proved the existence of a commercial discovery and submitted and received approval of a development plan prepared by a third-party petroleum institute in Kazakhstan for the exploitation of the established commercial reserves. All our efforts during exploration stage have and will continue to focus on meeting these criteria. The terms of our commercial production rights will be negotiated at the time we apply to transition to commercial production. We became subject to a new tax code on January 1, 2009. Under the new tax code, the royalty we previously paid was replaced by a mineral extraction tax. The rate of the mineral extraction tax depends on annual production output. The new code currently provides for a 5% mineral extraction tax rate (6% in 2010 and 7% starting from 2011) on production sold to the export market, and a 2.5% tax rate (3% in 2010 and 3.5% starting from 2011) on production sold to the domestic market. In January 2009 we also became subject for a rent export tax, which is calculated based on the export sales price. This tax ranges from as low as 0% if the price is less than $40 per barrel to as high as 32% if the price per barrel exceeds $190. During fiscal 2009 we completed six new wells in total. Three wells on the Kariman field, one well on the Dolinnoe field and two wells on the Aksaz field. Our drilling strategy is aimed at geological exploratory drilling with the purpose of obtaining the in-depth information necessary for further exploration activities and transition to commercial production in the future, and drilling aimed at increasing production at the current stage. Although not all of our wells have resulted in commercially viable production rates, drilling results have provided valuable information which we are using to construct geological and geophysical models of our fields, correction and amendments of 3D seismic results and more precise well location decision making procedures. The following table sets forth the number of oil and natural gas wells in which we owned an interest as of March 31, 2009. As of the fiscal year ended March 31, 2009, each of the 24 wells identified above was in test production, testing or under/awaiting workover. According to the laws of the Republic of Kazakhstan, we are required to test every prospective target on our properties separately, this includes the completion of well surveys on different modes with various choke sizes on each horizon. In the course of well testing, when the transfer from target to target occurs, the well must be shut in; oil production ceases for the period of mobilization/demobilization of the workover rig, pull out of the hole, run in the hole, perforation, packer installation time, etc. This has the effect of artificially diminishing production rates averaged over a set period of time. During our fourth fiscal quarter, our average daily crude oil production was 2,961 barrels per day. Following is a brief description of the production rates of each of our 24 wells during the fiscal year ended March 31, 2009. A first target was tested on March 27, 2008. The first week’s production was 110 bpd. In April 2008 it dropped to 63 bpd. For a couple of days the well was shut-in for a pressure build-up. After that production dropped to 26 bpd. We carried out an acid injection and hydro-impulsive cleaning and aeration, however, it hasn’t yielded significant results. We conducted bottom-hole zone cleaning to stimulate oil flow in August 2008. At the present moment, the well is producing sporadically. We intend to complete a comprehensive study of oil flow stimulation activities, including installation of various pumps should results of research provide indication of the possibility of production increase. This well was completed during the quarter ended March 31, 2008. At the present moment, the well produces sporadically. We have lowered a down-hole pump but such activities yielded no significant results. We plan to continue sporadic production from this well without spending any significant additional funds for workover activities in the near future. We have installed a downhole pump at the Kariman-1 well which continues to produce sporadically. We are investigating possibility of centrifugal pumps installation on this well. We have installed a bottom-hole pump at this well. At the present moment we are researching various available options for increasing oil production rates from this well. We have installed centrifugal submersible pumps at these wells. After a brief period of testing and fine tuning, production from this well stabilized. Stabilized production rates are included in the table above. We expect to install a bottom-hole pump at the Kariman-5 well when a workover rig becomes available. During the quarter ended December 31, 2008, we reduced our planned capital expenditure program for the remainder of the fiscal year and the upcoming fiscal year. During the past several years we have pursued an aggressive capital expenditure and drilling program. We pursued this aggressive strategy, in part, to complete our mandated exploration activities and move our contract territory to commercial production by July 2009, as our rights to the contract territory could have been terminated and reverted back to the government of the Republic of Kazakhstan had we not done so. With the grant of the extension of time to complete exploration activities, to January 2013, we now have more flexibility in the pace of our exploration drilling efforts and application for transition to commercial production. As a result of reduced world oil prices and, corresponding reduction in our revenues, we do not have sufficient capital available to continue to support the aggressive drilling strategy we pursued during the past several years. The reduction in anticipated revenues from production is due to several factors, including, the material drop in world oil prices; several wells we have recently completed have not generated substantial production; the decline rates on existing wells has, in many cases, been more steep than expected due to the need for reworking and treatment to remove paraffin buildup occurring during a colder than normal winter; and the imposition by the Republic of Kazakhstan of an export duty on all oil sold outside the domestic market in Kazakhstan. our crude oil to domestic markets starting in late October 2008. This significant increase in the supply of crude oil to the domestic market in Kazakhstan led to low domestic prices and logistical issues as there is only one refinery that services western Kazakhstan oil producers. As a result several times during the quarter ending December 31, 2008, there were periods when we were unable to ship crude oil to the domestic market. This led to the crude oil inventories at the oil storage facility we lease to exceed storage capacity. As a result, we had to partially or completely (through choke scale down) shutdown several wells. Due to the pressure drop and paraffin build-up during such suspension of production, we were unable to return to the previous production rates at several wells. We have developed and commenced a production restoration program based on installation and running of submersible centrifugal and bottom-hole pumps at non-producing or low-producing wells. We have completed installation of such pumps at the Kariman-4 and Kariman-7 wells during the fiscal quarter ending March 31, 2009. With the ingoing workover stimulation program we hope to restore the production level close to the levels experienced at the end of the fiscal quarter ending March 31, 2008. Based on the successful results of centrifugal pumps usage, we have proceeded with extensive workover program at the existing Kariman wellstock. In the period following the fiscal year 2009 we have continued installation of the centrifugal pumps at the Kariman-10 and Kariman-11 wells. We are currently engaged in installation of the bottom-hole pumps at the Kariman-3 and Kariman-5 wells. We believe we have identified a technique for oil flow stimulation and intensification suitable for the peculiar needs of the Kariman field. We plan to continue with this program and will install centrifugal pumps on as-needed basis on the Kariman wells where we believe the use of pumps will result in greater production than the natural flow rate. We are also in the process of researching various available options for using similarly-designed pumps at the Dolinnoe and Aksaz fields, both of which have higher natural gas content making it impossible to apply the same equipment currently used on the Kariman field. We expect to continue working with the existing wellstock for the reminder of the fiscal year ending 2010 with the purpose of increasing and sustaining production rates from existing wells. The following table sets forth certain information regarding the total costs incurred associated with exploration, development and acquisition activities. The following table sets forth certain information regarding production volumes, average sales price and average operating expense associated with our sale of oil and natural gas for the periods indicated. During the years ended March 31, 2009, 2008 and 2007, the Company has not engaged in any hedging activities, including derivatives. Includes transportation cost, production cost and ad valorem taxes. We use sales volume rather than production volume for calculation of per unit cost because not all volume produced is sold during the period. The related production costs were expensed only for the units sold, not produced based on a matching principle of accounting. Therefore, oil and gas operating expense per BOE was calculated by dividing oil and gas operating expenses for the year by the volume of oil sold during the year. In December 2003, a complaint was filed in the 15th Judicial Court in and for Palm Beach County, Florida, naming, among others, the Company and former directors, Georges Benarroch and Alexandre Agaian, as defendants. The plaintiffs, Brian Savage, Thomas Sinclair and Sokol Holdings, Inc. allege claims of breach of contract, unjust enrichment, breach of fiduciary duty, conversion and violation of a Florida trade secret statute in connection with a business plan for the development of the Aksaz, Dolinnoe and Emir oil and gas fields owned by Emir Oil, LLP. The parties mutually agreed to dismiss this lawsuit without prejudice. In April 2005, Sokol Holdings, Inc., also filed a complaint in United States District Court, Southern District of New York alleging that BMB Munai, Inc., Boris Cherdabayev, and former BMB directors Alexandre Agaian, Bakhytbek Baiseitov, Mirgali Kunayev and Georges Benarroch wrongfully induced Toleush Tolmakov to breach a contract under which Mr. Tolmakov had agreed to sell to Sokol 70% of his 90% interest in Emir Oil LLP. In October and November 2005, Sokol Holdings filed amendments to its complaint in the U.S. District Court in New York to add Brian Savage and Thomas Sinclair as plaintiffs and to add Credifinance Capital, Inc., and Credifinance Securities, Ltd. (collectively “Credifinance”) as defendants in the matter. The amended complaints alleged: i) tortious interference with contract, specific performance, breach of contract, unjust enrichment, unfair competition-misappropriation of labors and expenditures against all defendants; ii) breach of fiduciary duty, tortious interference with fiduciary duty and aiding and abetting breach of fiduciary duty by Mr. Agaian, Mr. Benarroch and Credifinance; and iii) breach of fiduciary duty by Mr. Cherdabayev, Mr. Kunayev and Mr. Baiseitov, in connection with a business plan for the development of the Aksaz, Dolinnoe and Emir oil and gas fields owned by Emir Oil, LLP. The plaintiffs have not named Toleush Tolmakov as a defendant in the action nor have the plaintiffs ever brought claims against Mr. Tolmakov to establish the existence or breach of any legally binding agreement between the plaintiffs and Mr. Tolmakov. The plaintiffs seek damages in an amount to be determined at trial, punitive damages, specific performance and such other relief as the Court finds just and reasonable. The Company moved for dismissal of the amended complaint or for a stay pending arbitration in Kazakhstan. That motion was denied, without prejudice to renewing it, to enable defendants to produce documents to plaintiffs relating to the issues raised in the motion. Following completion of document production, the motion was renewed. Briefing on the motion was completed on August 24, 2006. On June 14, 2007, the court ruled on our motion. The court (a) denied the motion to dismiss on the ground that Kazakhstan is a more convenient forum; (b) denied the motion to dismiss in favor of litigation in New York state court; (c) denied the motion to stay pending arbitration in Kazakhstan; and (d) denied the motion to dismiss on the ground that Mr. Tolmakov is an indispensable party. The court also (a) denied the motion (by defendants other than the Company) to dismiss for lack of personal jurisdiction and (b) granted the motion (by defendants other than the Company) to dismiss several claims for relief alleging breach of fiduciary duty, tortious interference with fiduciary duty and aiding and abetting breach of fiduciary duty. The court dismissed as moot the Company’s cross-motion to stay discovery and instructed the parties to comply with the Magistrate Judge’s discovery schedule. The Company appealed the court’s refusal to stay the litigation pending arbitration in Kazakhstan. On September 28, 2008, the Court of Appeals issued a decision in which it (a) reversed the district court's refusal to stay the claim for specific performance pending arbitration and (b) affirmed the balance of the district court's order. During the year, the Company changed its legal counsel to represent all defendants in the lawsuit from Bracewell & Giuliani LLP in New York, New York to Manning, Curtis, Bradshaw & Bednar LLC in Salt Lake City, Utah. On December 12, 2008, plaintiffs sought leave to file a Third Amended Complaint to add claims for (a) breach of fiduciary duty against defendants Cherdabayev, Kunayev, Baiseitov, Agaian, Benarroch and Credifinance based on these defendants’ alleged role as promoters of Sokol, (b) fraud against all defendants; and (c) promissory estoppel against defendants Cherdabayev, Kunayev and Baiseitov. Defendants opposed the Motion for Leave to Amend. That motion has been fully briefed but it has not yet been decided by the court. Fact discovery on the existing claims has been completed and the parties are now conducting expert discovery and reports. Plaintiffs have submitted an expert report on damages that claims damages of between $6.7 million and $10.9 million, plus interest. The Company disputes the Plaintiffs’ damage claim, in addition to disputing liability. No trial date has been established. Other than the foregoing, to the knowledge of management, there is no other material litigation or governmental agency proceeding pending or threatened against the Company or our management. No matters were submitted to a vote of security holders during the quarter ended March 31, 2009. Our common stock is traded on the NYSE Amex Equities under the symbol “KAZ.” Our shares are also traded on XETRA , the Deutsche Borse electronic trading system under SE code DL-,001 DMW US09656A1051. The following table presents the high and low sales price for the fiscal year ended March 31, 2009 and March 31, 2008, as reported by the NYSE Amex Equities. As of May 28, 2009, we had approximately 363 shareholders of record holding 47,378,420 shares of our common stock. The number of record holders was determined from the records of our transfer agent and does not include beneficial owners of common stock whose shares are held in the names of various security brokers, dealers, and registered clearing agencies. We have not declared or paid a cash dividend on our common stock during the past two fiscal years. Our ability to pay dividends is subject to limitations imposed by Nevada law. Under Nevada law, dividends may be paid to the extent that a corporation’s assets exceed it liabilities and it is able to pay its debts as they become due in the usual course of business. At the present time, our board of directors does not anticipate paying any dividends in the foreseeable future; rather, the board of directors intends to retain earnings that could be distributed, if any, to fund operations and develop our business. The performance graph below compares the cumulative total shareholder return of our common stock with the NYSE Amex Equity Composite Index and a peer group index. The graph assumes an investment of $100 on March 31, 2004 and reinvestment of dividends, if any, on the date of payment without commissions. The plot points were provided by Standard & Poor’s Institutional Market Services, Centennial, Colorado. The performance graph represents past performance, which may not be indicative of future performance. The peer group consists of Abraxas Petroleum Corp, American Oil & Gas, Inc., CanArgo Energy Corp, Gasco Energy Corp, Teton Energy Corp, Transmeridian Exploration Inc. (for the portions of the above periods during which such companies had publicly traded common stock). No instruments defining the rights of the holders of any class of registered securities were materially modified, limited or qualified during the quarter ended March 31, 2009. We did not sell any equity securities during the quarter ended March 31, 2009. We did not make any repurchases of our equity securities during the year ended March 31, 2009. The selected consolidated financial information set forth below is derived from our consolidated balance sheets and statements of operations as of and for the years ended March 31, 2009, 2008, 2007, 2006 and 2005. The data set forth below should be read in conjunction with “Management’s Discussion and Analysis of Financial Condition and Results of Operations” and the consolidated financial statements and related notes thereto included in this annual report. This discussion summarizes the significant factors affecting our consolidated operating results, financial condition, liquidity and capital resources during the fiscal years ended March 31, 2009, 2008 and 2007. This discussion should be read in conjunction with the consolidated financial statements and footnotes to the consolidated financial statements included in this annual report. Represents depletion of oil and gas properties only. We use sales volume rather than production volume for calculation of per unit cost because not all volume produced is sold during the period. The related production costs are expensed only for the units sold, not produced, based on a matching principle of accounting. Oil and gas operating expense per BOE is calculated by dividing oil and gas operating expenses for the year by the volume of oil sold during the year. Year ended March 31, 2009 compared to the year ended March 31, 2008. The following table summarizes production volumes, average sales prices and operating revenue for our oil and natural gas operations for the year ended March 31, 2009 and the year ended March 31, 2008. At times, we may produce more barrels than we sell in a given period. The average sales price is calculated based on the average sales price per barrel sold, not per barrel produced. We did not engage in hedging transactions, including derivatives, during the year ended March 31, 2009 or the year ended March 31, 2008. Revenue. We generate revenue under our exploration contract from the sale of oil recovered during test production. During the year ended March 31, 2009 our oil production increased 19% compared to the year ended March 31, 2008. This increase in production is primarily attributable to the fact that we had twenty four wells in testing or test production during all or some portion of the year ended March 31, 2009 compared to sixteen wells during all or some portion of the year ended March 31, 2008. During the year ended March 31, 2009 we realized revenue from oil sales of $69,616,875 compared to $60,196,626 during the year ended March 31, 2008. The largest contributing factor to the 16% increase in revenue was a 20% increase in sales volume, which was partially offset by 3% decrease in the price per barrel we received for oil sales during the year ended March 31, 2009 compared to the fiscal year ended March 31, 2008. During the fiscal years ended March 31, 2009 and 2008 we exported 81% and 91% of our oil, respectively, to the world markets and realized the world market price for those sales. Revenue from oil sold to the world markets made up 94% and 96% of total revenue, respectively, during the years ended March 31, 2009 and 2008. We anticipate production to remain fairly constant and currently anticipate revenues will be flat in upcoming quarters. As discussed above, our revenue is sensitive to changes in prices received for our oil. Most of our production is currently being sold at the prevailing world market price, which fluctuates in response to many factors that are outside our control. Imbalances in the supply and demand for oil can have a dramatic effect on the price we receive for our production. Similarly, if we were denied an export quota, our export quota were reduced or we were otherwise forced to sell all, or a significant portion, of our production to the domestic market in Kazakhstan. Historically the price per barrel of oil we receive for oil sold in Kazakhstan has been significantly lower than the price we realize for oil we export. For a period during the year, as a result of the material decline in world oil prices and the export duty enacted by the government, we realized greater returns by selling to the local market. As a result of the material drop in world oil prices our revenue decreased significantly during the year. Political instability, the economy, changes in legislation and taxation, weather and other factors outside our control may also have an impact on both supply and demand. Historically, sales to the domestic market in Kazakhstan would have resulted in a significant reduction in revenue and income from operations because the domestic market price has been markedly lower than world oil prices. As the gap between world oil prices and domestic prices shrank and as a result of the export duty, we found it more financially attractive to sell our oil to the domestic market for the period from November 2008 through January 2009. Export Duty. On April 18, 2008 the government of the Republic of Kazakhstan introduced an export duty on several products (including crude oil). We became subject to the duty in June 2008. The export duty for year ended March 31, 2009 amounted to $6,783,278. The formula for determining the amount of the crude oil export duty was based on a sliding scale that was tied to the world market price for oil. The amount of the export duty changed with fluctuations in world oil prices. Fluctuations in the export duty, however, lagged behind fluctuations in world oil prices by about 90 days. In December 2008 the government of the Republic of Kazakhstan repealed the export duty effective January 26, 2009. We are now subject to the new tax code that went into effect on January 1, 2009, as discussed in more detail below. Oil and Gas Operating Expenses. During the year ended March 31, 2009 we incurred $7,998,012 in oil and gas operating expenses compared to $5,515,403 during the year ended March 31, 2008. This increase is primarily the result of several factors, including increased production volumes, royalty payments, salary and transportation expenses and increased repair costs. During the year ended March 31, 2009 royalty paid to the government increased by $186,688 or 12% compared to the year ended March 31, 2008. While royalty expenses increased, as a percentage of total revenue, royalty expense remained nearly unchanged. Royalties were replaced by a mineral extraction tax when we became subject to the new tax code effective January 1, 2009. Mineral Extraction Tax. This tax replaced the royalty we were paying previously. The rate of this tax depends upon annual production output. At current production rates, we are subject to a 5% mineral extraction tax rate on production sold to the export market and a 2.5% tax rate on production sold to domestic market. The mineral extraction tax expense is reported as part of oil and gas operating expense. During the year ended March 31, 2009 mineral extraction tax paid to the government amounted to $467,359. As noted above, we were not subject to the mineral extraction tax during the year ended March 31, 2008 or during the first three fiscal quarters of year ended March 31, 2009. Rent Export Tax. This tax is calculated based on the export sales price and ranges from as low as 0% if the export sales price is less than $40 per barrel to as high as 32% if the price per barrel exceeds $190. Rent export tax is reported as part of oil and gas operating expense. During the year ended March 31, 2009 rent export tax paid to the government amounted to $515,032. We were not subject to the rent export tax during the year ended March 31, 2008 or during the first three fiscal quarters of the year ended March 31, 2009. During the year ended March 31, 2009 payroll and related payments to production personnel increased $158,816 or 24% compared to the year ended March 31, 2008. As production volume increased we retained additional production personnel during the year ended March 31, 2009. Transportation expenses increased $1,154,715 or 35% as a result of the increased volume of oil we produced and transported. We anticipate transportation expenses will continue to fluctuate in proportion to production volume. We calculate oil and gas operating expense per BOE based on the volume of oil actually sold rather than production volume because not all volume produced during the period is sold during the period. The related production costs are expensed only for the units sold, not produced. While oil and gas operating expenses increased 45% during the year ended March 31, 2009 compared to the year ended March 31, 2008, expense per BOE increased only 21% from $6.15 per BOE during the year ended March 31, 2008 to $7.45 during the year ended March 31, 2009. During the year ended March 31, 2008 we sold 896,256 barrels of oil, during the year ended March 31, 2009 we sold 1,073,754 barrels of oil. As expense per BOE is a function of total expense divided by the number of barrels of oil sold, the 20% increase in sales volume more than offset the 45% increase in expenses resulting in the 21% increase in oil and gas operating expense per BOE. General and Administrative Expenses. General and administrative expenses during the year ended March 31, 2009 were $22,262,248 compared to $14,747,754 during the year ended March 31, 2008. This represents a 51% increase in general and administrative expenses. This increase in general and administrative expenses was the result of several factors such as increases in non-cash compensation expense, payroll and related costs, rent expense and professional services. This increase was partially offset by a $332,216, or 34%, reduction in environmental payments for flaring of unused natural gas. During the year ended March 31, 2009 we recognized non-cash compensation expense of $7,450,211 resulting from restricted stock grants made previously to employees. By comparison, during the year ended March 31, 2008 we recognized non-cash compensation expense in the amount of $2,303,078 for restricted stock grants issued to employees and outside consultants. a 30% increase in professional services resulting from legal fees incurred in our ongoing litigation. Depletion. 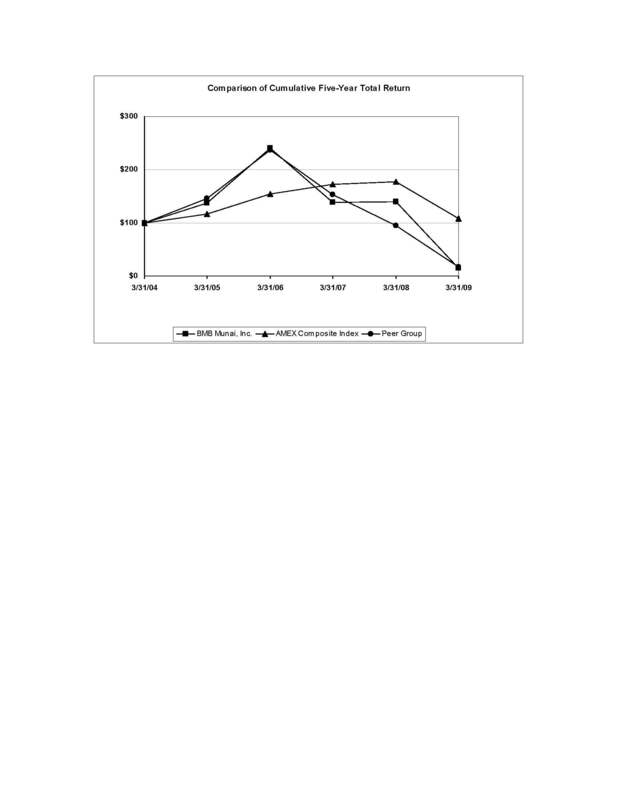 Depletion expense for the year ended March 31, 2009 increased by $983,673 compared to the year ended March 31, 2008. The major reason for this increase in depletion expense was a 20% increase in sales volume in fiscal 2009 compared to fiscal 2008. The increase in depletion expense was also attributable to the fact that we drilled additional wells, continued workover on existing wells and developed additional infrastructure during fiscal year 2009. Depreciation and Amortization. Depreciation and amortization expense for the year ended March 31, 2009 increased 35% compared to the year ended March 31, 2008. The increase resulted from purchases of fixed assets during the year. Consulting Expense. In November 2007 we retained a consultant to assist us in negotiating an extension of the exploration period of our contract and with potential acquisitions. On June 24, 2008, we were granted an extension of our existing exploration contract from July 2009 to January 2013. Compensation expense for consulting services was recorded in the amount of $11,727,500, which included $1,000,000 paid upon the execution of consulting agreement and non-cash share-based compensation in the amount of $10,727,500 as the success fee for the extension of time period for exploration. The share-based compensation represents 1,750,000 (500,000 shares for each additional year of the extension of exploration status) valued at $6.13 per share which was the closing market price of our common shares on June 24, 2008. On September 16, 2008 this consulting agreement was revised and the parties agreed to decrease the number of shares issued for services provided by 500,000 shares. The non-cash compensation expenses for consulting services were reversed in the amount of $3,065,000 (500,000 shares valued at $6.13 per share which was the closing market price of our common shares on June 24, 2008) for the year ended March 31, 2009. Income from Operations. During the year ended March 31, 2009 we realized income from operations of $11,595,582 compared to income from operations of $30,020,087 during the year ended March 31, 2008. This decrease in income from operations during fiscal 2009 is the result of the 92% increase in total expenses during fiscal 2009, which increase was only partially offset by a 16% increase in revenue. Other Income. During the fiscal year ended March 31, 2009 we realized total other income of $4,533,704 compared to $1,186,895 during the fiscal year ended March 31, 2008. This 282% increase is largely attributable to a $2,592,341 foreign exchange gain resulting mainly from the revaluation of accounts payable denominated in Kazakhstani tenge and $1,650,293 we received from a shareholder of the Company as disgorgement of profits earned in violation of the short-swing profit rules of Section 16(b) of the Securities Exchange Act of 1934. Net Income. For all of the foregoing reasons, during the year ended March 31, 2009 we realized net income of $17,157,558 or $0.38 basic and $0.37 diluted income per share compared to a net income of $31,310,564 or $0.70 basic and $0.70 diluted income per share for the year ended March 31, 2008. Year ended March 31, 2008, compared to the year ended March 31, 2007. The following table summarizes production volumes, average sales prices and operating revenue for our oil and natural gas operations for the year ended March 31, 2008 and the year ended March 31, 2007. We did not engage in hedging transactions, including derivatives during the year ended March 31, 2008, or the year ended March 31, 2007. Revenue. During the year ended March 31, 2008 our oil production increased 182% compared to the year ended March 31, 2007. This significant increase in production is primarily attributable to the fact that we had sixteen wells in testing or test production during all or some portion of the year ended March 31, 2008 compared to eight wells during all or some portion of the year ended March 31, 2007. During the year ended March 31, 2008 we realized revenue from oil sales of $60,196,626 compared to $15,785,784 during the year ended March 31, 2007. The largest contributing factor to the 281% increase in revenue was a 184% increase in sales volume. Another factor contributing to the increase in revenues was a 34% increase in the price per barrel we received for oil sales during the year ended March 31, 2008 compared to the year ended March 31, 2007. During the fiscal years ended March 31, 2008 and 2007 we exported 91% and 100% of our oil, respectively to the world markets and realized the world market price for those sales. Revenue from oil sold to the world markets made up 96% and 100% of total revenue, respectively, during the years ended March 31, 2008 and 2007. Oil and Gas Operating Expenses. During the year ended March 31, 2008 we incurred $5,515,403 in oil and gas operating expenses compared to $2,272,251 during the year ended March 31, 2007. This significant increase is primarily the result of several factors, including increased royalty, salary and transportation expenses and increased repair costs.